One last hydrologic sampling run before the winter! This past month, team member Catherine Kuhn popped out to the ranch for a three day sampling bonanza. Over the course of her trip, she was able to visit all sampling sites from Double Cross up to Deer Lake in the Cloud Peak Wilderness. Catherine was collecting her usual samples for dissolved gas, stream pH, temperature and dissolved ions. This time, however, she was also able to sample for dissolved oxygen, dissolved inorganic carbon and stable carbon isotopes. These three new parameters will help us fill in a more complete picture of the sources and amounts of inorganic carbon cycling through Clear Creek. These new metrics have been made possible by Pete Raymond’s lab, who gave us access to a YSI probe to measure dissolved oxygen in situ, and the Yale Institute for Biospheric Studies, who donated the vacuum tubes we need for stable isotope testing. This experience was also made possible by a fantastic local volunteer, Bridger Konkel. Bridger has extensive experience collecting scientific data through his work with the Peregrine Fund and was an awesome hiking companion because of his exciting stories about field work in Greenland. Bridger was also able to give Catherine some tips on what to wear in the mountains during hunting season (Picture 1). He accompanied Catherine on her biggest day of sampling at the sites above Buffalo and was an asset in ensuring all sampling was completed. Our team lucked out with beautiful weather for this final sampling run of the 2014 water year. 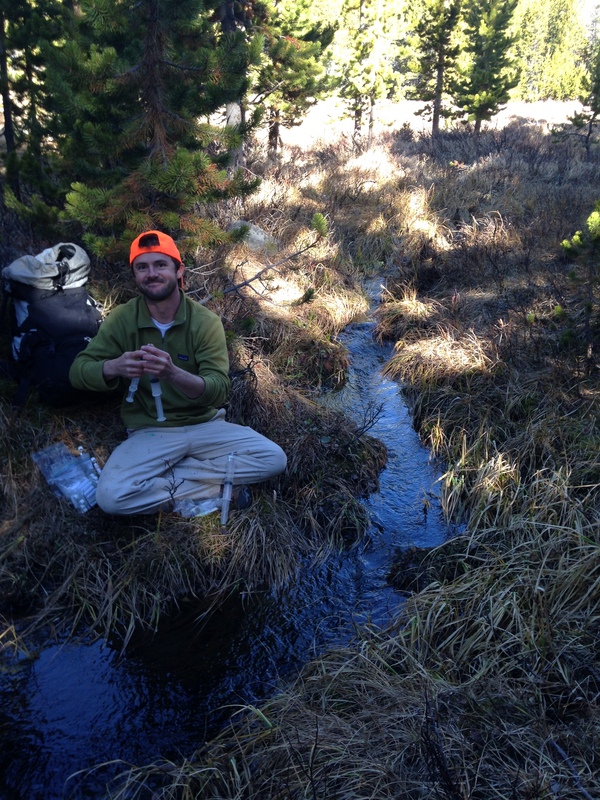 New volunteer Bridger Konkel collecting water samples for dissolved greenhouse gases. This entry was posted in Uncategorized, Water. Bookmark the permalink.